Mr Ben Nunoo Mensah, the President of Ghana Olympic Committee (GOC) has hinted of the Association of National Olympic Committees of Africa (ANOCA) $1 million to support all elite athletes for the 2020 Olympic Games in Tokyo, Japan. The fund would be used for preparation for the Games, and it is the hope of ANOCA that the amount together with the current Olympic Solidarity Scholarships being enjoyed by the athletes, would give them enough financial support to prepare adequately. It will also enable the athletes attend as many competitions as possible, before the Tokyo games. Mr Nunoo Mensah, speaking at the 6th Association of International Sports Press (AIPS) Africa Congress in Accra on Friday said, the ANOCA Tokyo 2020 Commission would work with all the various National Olympic Committees (NOCs) in Africa to ensure that preparation by all the elite athletes are properly coordinated to maximize Africa’s medal haul at the games. He said, with ANOCA’s theme of ‘‘How Bold is Africa’s Gold Chase at Tokyo 2020’, and Africa’s quest to conquer the World, the ANOCA President, Mustapha Berraf is putting in place some mechanisms to achieve the target at the quadrennial Games. He said ANOCA was also looking at the possibility of organising a training camp for all African athletes who would qualify for Tokyo 2020, to help improve Africa’s performance at the games. According to the GOC President, the Black Meteors are one of Africa’s medal hopeful for Tokyo 2020 having won Africa’s first medal in football in 1992 in Barcelona, Spain. Countries like Nigeria and Cameroun have also won medals in football for the continent and it is ANOCA’s hope that this feat will be replicated in Tokyo. On AIPS theme for the 6th Congress, “New Sports Journalism in Africa-Finding the Right Mix” he touched on funding and branding of sports and the role that journalists play in the development of sports in Africa. He said “In a continent where funding of sports has always been a challenge to most governments our next surest bet for funding for our sports, are the corporate entities but these corporate entities will want returns on their investments, returns not only by way of medals but more important to them, is returns in mileage and visibility for the sponsoring brand, and it is the media who give mileage to the sponsors. “In most African countries we turn to brand our sports with the 5 per cent negative news and leave out the 95 per cent good things happening in the sports. No sponsor will want its product to be associated with a bad brand. He stressed that, journalists are very key to the development of sports in Africa and that, they shouldn’t underestimate that vital role. Other resource personnel at the 6th AIPS Congress who shared ideas were Neil Armstrong Mortagbe, a sports markerter, former GFA Vice President Fred Pappoe, former Black Stars player, John Paintsil, Magnus Rex Danquah of the Ghana 2023 Hosting Committee and Michell Obi, the AIPS Africa President. Neil Armstrong delivered a Presentation on "The Expanded Africa Cup of Nations 2019: Impact on Marketing, Sponsorship and Infrastructure" at the Africa Congress of the International Sports Press Association. He said it was a really invigorating experience and he is looking forward to significant actions arising out of the interaction. 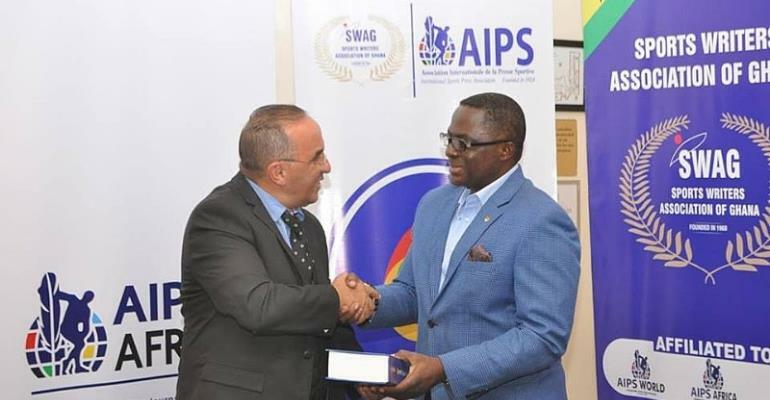 “My appreciation to the President of the Sports Writers Association of Ghana, "Writer" Kwabena Yeboah, General Secretary William Dodzi and the entire Executive of SWAG and AIPS for the invitation,” he noted. Vava Africa......Unleashing the Potential of the African Continent! !